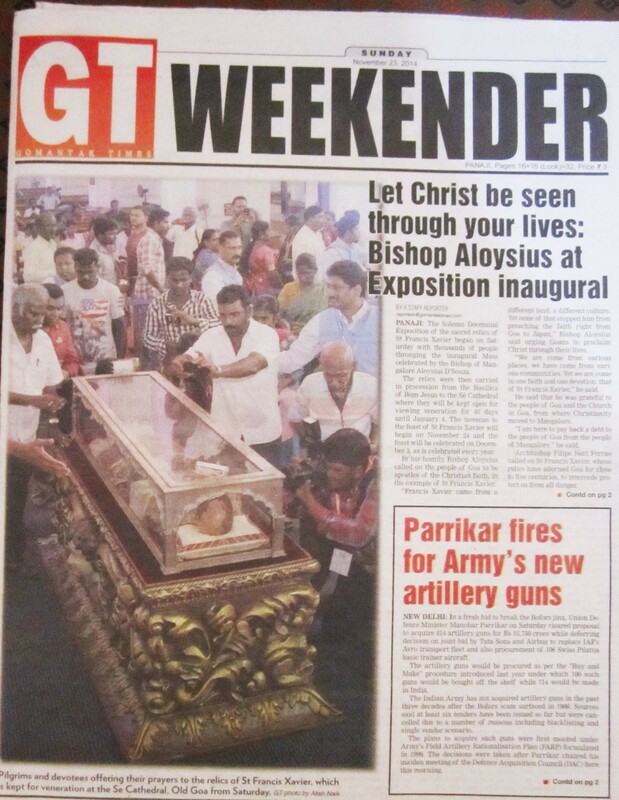 The Roman Catholic Church in Goa leads the people into forbidden idolatry in the name of “Christ”, and defame Jesus of the Bible. 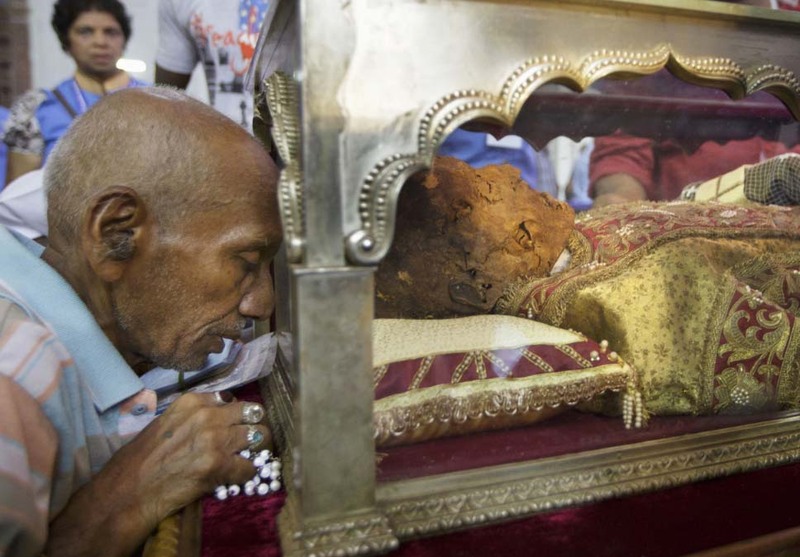 A poor Indian is lead into idolatry in Goa, paying to the remains of a mortal Spaniard. The state of affairs in Goa in India is going from bad to disastrous. The Roman Catholic archbishop leads the citizens into worship of a corpse, a skeleton, the possible remains of an European imperial Jesuit priest. The Church has promised the people that 5 million pilgrims will come during the 44 days of exposure of Spaniard Francis Xavier. 75 million USD (4.000 Cr. rupee) is expected in revenue, from a daily influx of 100.000 visitors to Old Goa. A promise that has already been broken during the two first days of exposition, since hardly 18.000 devotees turned up this weekend. The Times of India, 20th of November 2014. Will the Indian press hold the Catholic Church accountable, or will the editors continue to mislead their readers? 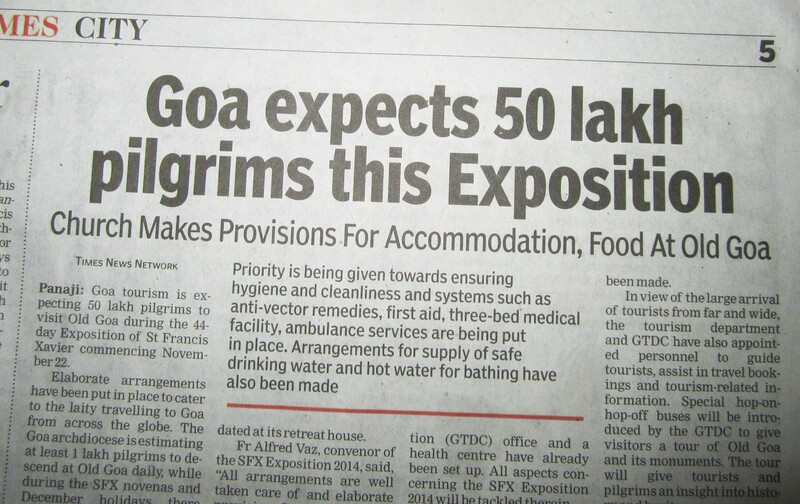 The local media in Goa is backing the Church, hoping the state will make a quick buck from the pilgrims. Gomantak Times, 23rd of November 2014. 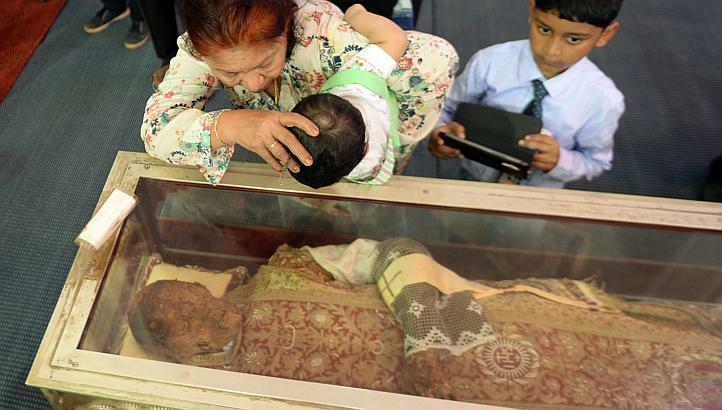 Even small children are forced to kiss the glass box which contains the 500 year old corpse. The most serious side of this religious ritual, is the defamation of the scriptures. The Bible warns all Christian neither to consult the dead, nor to pray to the dead. The adoration, veneration and worship of all true Christians are towards God alone. The Roman Catholic religion ignore the Bible. All who follows the instructions of the Papacy are lead into blasphemy against God of the Bible. In the state of Goa, false Christianity is making the scriptures null and void. Let no one be found among you who sacrifices their son or daughter in the fire, who practices divination or sorcery, interprets omens, engages in witchcraft, or casts spells, or who is a medium or spiritist or who consults the dead. Anyone who does these things is detestable to the Lord. Unfortunately, the small number of goan Christian leaders are silent. Not standing up for the truth, and demanding an end to this forbidden idolatry in the name of Christ. We must all pray for the goans, that they will all be released from this kind of deceptions and spiritual slavery. That they will renounce their false Apostles, and rather embrace Jesus the Messiah, the savior of the World. Amen. Thank you for making us aware of this, for the purpose of prayer and to open the eyes of God’s children! It is so sad that many innocently believe the nonsense that the RCC peddles rather than investigating the Scriptures. Are Bibles available in Goa, Ivar? The Catholicism already rejected by Jesus Christ. They are invented community bible, and they are mingled with world religion. God condemned them. Mar papa is a ambassador of Satan. De Wette III, 61. quoted in O’Hare, THE FACTS ABOUT LUTHER, 208. Walch XIV, 1360. quoted in O’Hare, Ibid, 209. It is well documented that Luther was likely possessed by some sort of demonic being, but in a moment of clarity, the devils fool realized his great error, will you before it’s too late? God bless, but just in case, better pack some SPF 1,000,000 lol! In India visit the tombs of holy people is done by Christians, Hindus and Muslim. Sometimes a revered person is visited by members of other religions because during his/hers lifetime the person was considered nearer God. Like mother Teresa, whose funeral was national. In this case most of the pilgrims will be Hindus, as always. Most peole are not aware that he was part of the inquisition. According to scripture the two witness will be displayed in jerusalem where the Christ was killed, who do you think will be the ones to put on this display? I’ve seen the Catholics display corpse for praise but I’ve seen the Muslims display the corpse to show an example of fearand dominance to the people. We’ve seen these exhibits in the streets of Egypt in crucifictions with media posting these videos and photo’s on line. I’ve seen them. Who has Jerusalem under their control now? Who is presecuting their beliefs right now? We are coming closer and closer to the truth of our oppressor and the WORDS of G-D fulfilled in prophecy. We need to be very aware of what holidays celebrate death and gifts are exchanged for them. No one should celebrate death! We should also watch for the earthquake since G-D always speaks with earth rumbling. There will be a disaster there in Jerusalem acoording to scripture. As the Christ was killed and He arose with earth tremblings so will these witnesses. 8	Their bodies will lie in the street of the great city, which is figuratively called Sodom and Egypt, where also their Lord was crucified. 9	For three and a half days men from every people, tribe, language and nation will gaze on their bodies and refuse them burial. 10	The inhabitants of the earth will gloat over them and will celebrate by sending each other gifts, because these two prophets had tormented those who live on the earth. 11	But after the three and a half days a breath of life from God entered them, and they stood on their feet, and terror struck those who saw them. 12	Then they heard a loud voice from heaven saying to them, “Come up here.” And they went up to heaven in a cloud, while their enemies looked on. 13	At that very hour there was a severe earthquake and a tenth of the city collapsed. Seven thousand people were killed in the earthquake, and the survivors were terrified and gave glory to the God of heaven. 14	The second woe has passed; the third woe is coming soon. 17	saying: “We give thanks to you, Lord God Almighty, the One who is and who was, because you have taken your great power and have begun to reign. Where is the worship? Catholics revere their saints because they are one in Christ. This is Scriptural. Their bodies are temples of the Holy Spirit. Think of what that means that our earthly vessel bodies are used in such a noble unimaginable way – as temples of God when He comes to live in us. The Church properly displays what that kind of reverence is like. Where is this even stated in either article that you’d posted? I’m not seeing it. Ok, I read the articles you’d posted, & they’re incomplete so I cannot verify one way or the other if your statements are true or false. I’m not seeing any of what you claim on these articles after trying to search them out online & read them for myself. Accountable for what specifically? What is there to be held accountable for that your perceive? The GT article is 2 pages long, & there is nothing presented on the page you’d posted demonstrating what you state. Is it on the other page that isn’t showing? Throw me a clue here, sir! Honestly! Where are the statements reported in the news that support your claims??? “Thou shalt not bear false witness against thy neighbour”. Do you even understand what this means, sir?